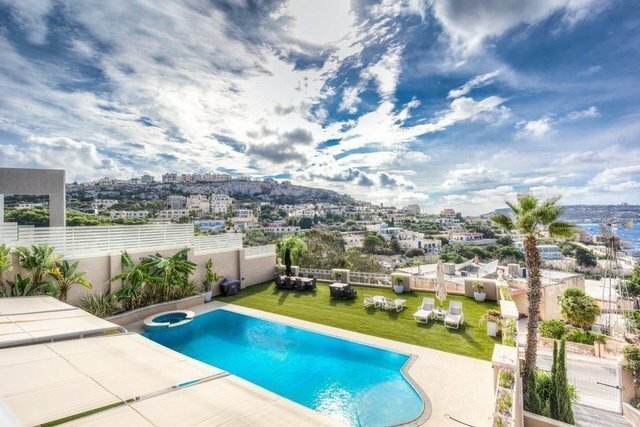 Designer finished detached villa situated on one of the best spots in the sought after residential area of Santa Maria Estates. Generous accommodation spread on a total foot print of 1124 sqm plot comprising of a welcoming grand entrance, guest toilet, study, fully fitted kitchen/breakfast, large living room and separate combined lounge/dining having an outlook on to an alfresco terrace enjoying views of the pool area, valley, and sea views of Ghadira Bay. Downstairs one finds three double bedrooms (main with en-suite), guest bathroom, laundry room, and gym/extra living room which leads to the pool kitchen/breakfast with outdoor dining area, swimming pool, and BBQ area enjoying open valley and sea views. Complimenting this property is an independent flat-let and a 6-car garage.